This English and Spelling course is filled with attractive and fun illustrations. It incorporates a well-balanced assortment of language arts and English-writing skills with consistent follow-up and review from week to week. Capitalization, kinds of sentences, correct punctuation at the end of sentences, recognition of simple nouns, verbs, adjectives, and prepositions, contractions, antonyms, homonyms, and alphabetizing of words are all covered throughout the course of the year. 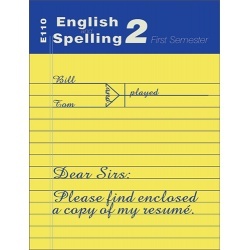 A completely phonics-based spelling is used. Students will develop their ability to think and express their thoughts correctly. Kinds of sentences, punctuation and capitalization rules, recognition of nouns, pronouns, verbs, adjectives, and prepositions, contractions, antonyms, homonyms, alphabetizing of words, dictionary skills, and writing compositions are all covered throughout the course of the year. 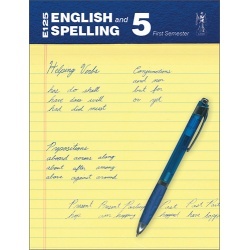 Spelling 3 contains 36 weeks of spelling lists with activities. Sentence structure, kinds of sentences, punctuation and capitalization rules, recognizing and using all eight parts of speech, contractions, antonyms, homonyms, alphabetizing of words, dictionary skills, letter writing, and writing compositions are all covered throughout the course of the year. Spelling 4 contains 36 weeks of spelling lists with activities and glossary. Sentence structure, kinds of sentences, punctuation and capitalization rules, recognizing and diagraming all eight parts of speech, contractions, antonyms, homonyms, using troublesome words correctly, letter writing – friendly, business, thank-you notes, and writing compositions are all covered throughout the course of the year. Spelling 6 contains 36 weeks of spelling lists with activities and glossary. Sentence structure, kinds of sentences, punctuation and capitalization rules, recognizing and diagramming all eight parts of speech, contractions, antonyms, homonyms, using troublesome words correctly, and writing compositions are all covered throughout the course of the year. 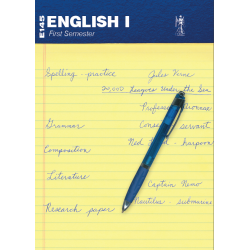 This course covers grammar, usage, and writing. During the third quarter the student is taught the procedure for writing a formal term paper.